The WOWSA Awards are an annual selection of outstanding individuals and offerings in the following categories: World Open Water Swimming Man of the Year, Woman of the Year, Performance of the Year, and Offering of the Year. There were innumerable outstanding solo, tandem and relay achievements performed in the open water in 2017. "There were so many possible award winners and nominees in the World Open Water Swimming Performance of the Year category that is meant to honor the efforts and swims that (1) best embody the spirit of open water swimming, (2) are representative of the sense of adventure, tenacity and perseverance that open water swimmers are known for, and (3) have demonstrated the most impressive open water swimming performance of the year," explains Steven Munatones. Margarita Llorens Bagur of Ciudadela, Islas Baleares, Spain was voted as the 2017 World Open Water Swimming Performance of the Year for her 73 km solo attempt to swim between Ibiza and Javea in the Spanish Islas Baleares. "For years, the 49-year-old president and inspiration of the Menorca Channel Swimming Association has been making several epic attempts in the Islas Baleares archipelago in her native Spain. Her unsuccessful crossings only made her stronger," describes Munatones. "In 2013, she attempted a 84 km swim from Ibiza to Mallorca (Cruce Canal Ibiza-Mallorca), but she called the swim after 20 hours 30 minutes and 74 km because of jellyfish. 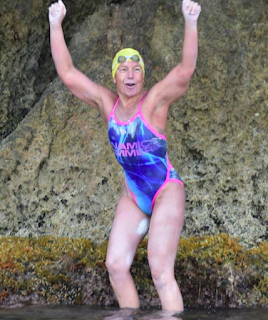 In 2014, she attempted the same 84 km swim again, but she ended up with the same result that she finally achieved in 2015 after 28 hours 13 minutes. In 2016, she attempted a 90 km solo swim between Eivissa and Dénia [shown below] and this past July 2017, she attempted a 90 km swim. 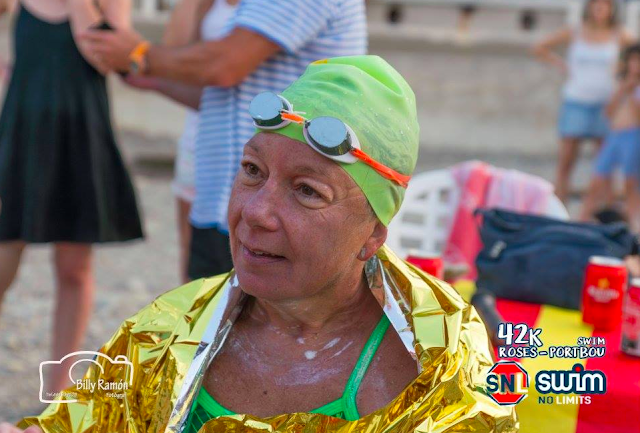 In preparation, she trained with an 11 hour 54 minute 42 km Swim Marathon Costa Brava from Roses to Port Boy in Spain. She was well-prepared for her challenge between Ibiza and Jávea in Islas Baleares. She swam and swam and swam for 73 km before difficult conditions and adverse currents led her crew to convince her to abort her pioneering attempt. She was not successful - this time - but she braved the elements for over a day and a half before facing another disappointment. 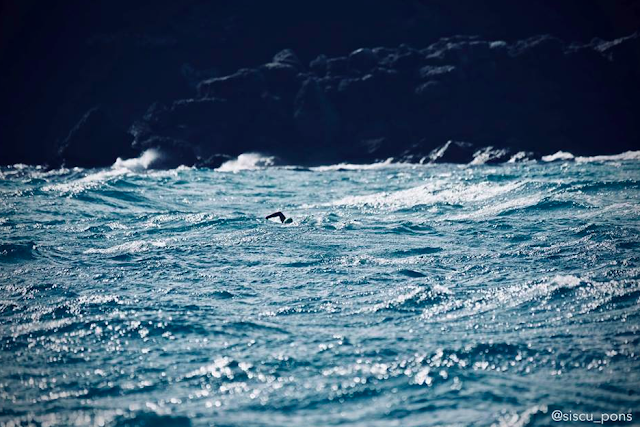 With several first-hand experiences, she and her chief kayaker Francisco Siscu Pons have come to understand that Mother Nature always has the upper hand in massively long marathon swims. But her admirable persistence in making extremely difficult channel attempts while continuing to help others realize their dreams is well-known and well-established. Tita's 90 km channel attempt was an official DNF - but the 49-year-old's effort was nevertheless inspiration and well-deserving for the 2017 World Open Water Swimming Performance of the Year." For the 2017 World Open Water Swimming Man of the Year Award, see here. For the 2017 World Open Water Swimming Woman of the Year Award, see here. For the 2017 World Open Water Swimming Offering of the Year Award, see here.